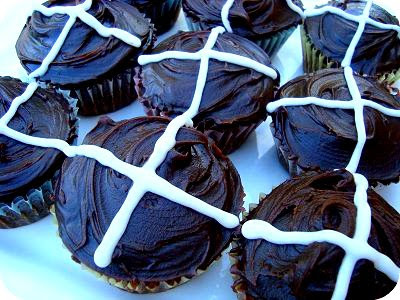 I'm not too good at making bread, so instead of attempting to make hot crossed buns this Easter, I decided to invent my own "Chocolate Crossed Cupcakes". Mmmmmmmm. So here they are, Chocolate Crossed Cupcakes with chocolate ganache icing. Have a wonderful Easter everyone!!! Cream butter, vanilla and sugar until light and fluffy. Add eggs one at a time, beating well after each addition. Sift flour and baking powder together (as well as cocoa if using it). Fold into creamed mixture. Stir in milk. Place 18 paper patty cases in patty tins. Spoon mixture evenly into paper cases. Bake at 190°C for 15 minutes or until cakes spring back when lightly touched. Transfer to a wire rack. When cold, ice with ganache icing (see below). Place the chocolate, cream and butter in a heatproof bowl over a pan of simmering water (not touching the water). Stire gently over low heat until melted and smooth. You can alternately place all the ingredients in a microwave safe bowl and heat until just melted and stir until smooth. Chill until firm, then spread evenly over each cupcake. To add the extra cross decoration, mix a small amount of icing sugar and a few dashes of hot water until smooth. Pipe a cross shape on top of each iced cupcake. Mmmmm looks lovely! You are very clever and the ICING sounds especially delish! happy easter to you and those you love. looks so yummy! happy easter to you and your family! Ooooh yum ! Thanks for the recipe . 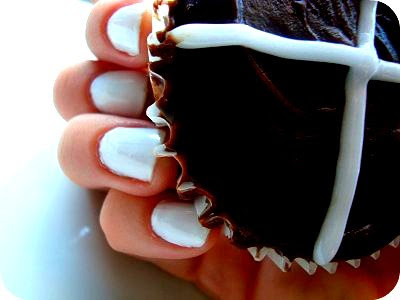 I love that the nails match the cupcakes! Too cute!